Earn 100 percent completion and the only ending in the Detroit: Become Human chapter Shades of Color. 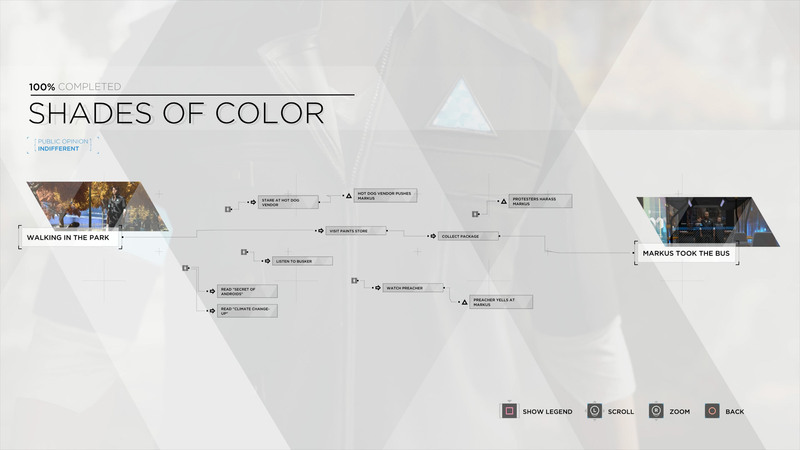 This walkthrough for Detroit: Become Human will earn players 100 percent completion in a single run of Shades of Color. The decisions made here will have very little impact on Markus in the future, with only an inconsequential conversation triggered if Markus engages with the protesters. This is one of the few chapters where 100 percent completion is possible in a single run. The 100% complete mission flowchart for Shades of Color. Getting a 100% completion in Shades of Color is fairly simple: players need only participate in a few activities before heading down the path to the pants store. From there, they'll be on a path straight toward the chapter's sole ending. This is the only ending available in Shades of Color. However, there is one event in this chapter that can impact The Painter, and that’s the Protesters Harass Markus event. If this happens Carl will comment on Markus’ torn clothing. If Markus avoids the protesters in Shades of Color, that is never brought up. Either way, this is only a minor detail and has no impact on the fates of any characters as the game plays out. With Shades of Color 100 percent complete, proceed to A New Home, or return to the Detroit: Become Human 100 percent walkthrough to browse all chapters and unlock all endings. Choices matter, and we take great care to help choose the best path for the desired outcome.